Testimonial – Comfort General Contracting Corp. Thank you for dropping by. Your opinion is very important to us. If you would like to leave us a comment, please feel free to post on the section below. We love the original and unique landscaping work designed and constructed by Ehsan of Comfort Seasonal Services. 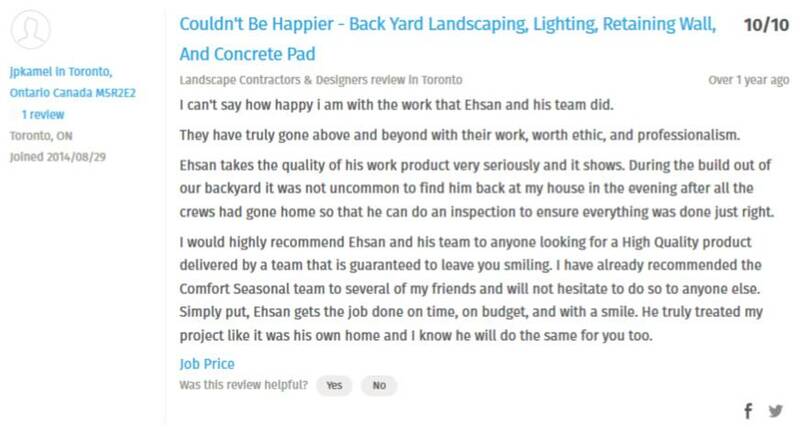 Ehsan is a true professional, conscientious and very detail oriented. We trusted his vision and were overwhelmed at the finished project. A huge thank you Ehsan and your awesome crew! Angie and Ron, THANK YOU SO MUCH for giving us the opportunity to Design | Build your landscape; and we genuinely take pride in the fact that you love it as much as we do. Mission accomplished! Lastly, it was a true honor serving your family and making great friends. See you all in the neighbourhood.